Published in December 2017, this is a history of the small gold rush town of Linton as told through selected photographs from the collection of the Linton and District Historical Society, many never before published. 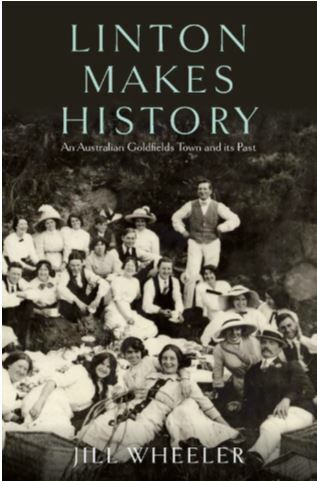 Chapters include: Beginnings, Gold, The Early Town, The Later Town, Agriculture and Industry, Education, Religion, Sports, Clubs & Societies, Linton People, Celebrations and Commemorations. With over 100 pages of historic black and white photographs, many never published before, you won’t want to miss out on your copy of this piece of Linton’s history. It is also available from Wares, Plants ‘n Things, The Known World Bookshop or the Shire Offices, all in Sussex St, or in Ballarat at Collins in the Bridge Mall, or Ballarat Books. 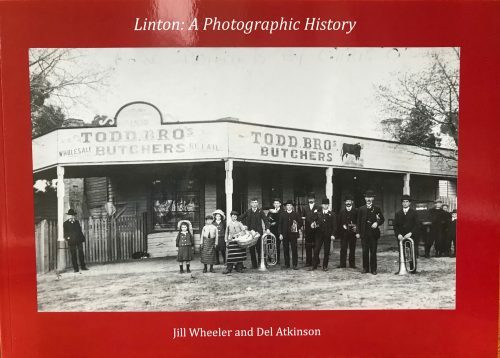 Published in 2015, Linton Makes History is based on Jill Wheeler’s PhD on the history of Linton. This is a detailed and scholarly history of the town and its people from the indigenous past through multiple layers of immigration to the present. A Walk-Drive Tour of Linton, is a booklet containing two history walks around the town of Linton and one drive around the surrounding district. There are detailed maps of each walk and of the walk/drive, and an estimated time in which each could be completed. At the beginning of the book is a brief history of Linton, which provides a context for the walks. [This publication is currently out of print but will be updated and re-published in the near future]. Christine Uren spoke about her memories of growing up in Linton in the 1950s and 1960s. Christine’s father, John (his adopted Australian name) Kvapil, was a resident in the Displaced Persons’ Camp at Snake Valley after World War 2. Christine spoke about her father’s previous life in Czechoslovakia, his daring escape across several borders at the end of the war and his eventual arrival in Australia as a displaced person in 1949. Joan shared the generalised story about the experiences of our ancestors on the Victorian goldfields. As each new wave of immigrants arrived they would have been regarded as ‘new chums’, that is, arrivals inexperienced in the way the goldfields functioned, mostly without the particular skills and knowledge necessary for gold digging. Joan described the journey, arrival, colonial life and the goldfields themselves. Early history of Lucky Woman’s and Happy Valley.